"A slight twist to an old favorite, this cheesy recipe will surely set their mouths to watering. 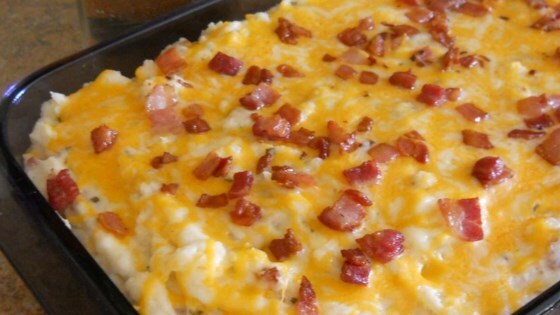 For a creamier casserole, use a potato masher and mash potatoes thoroughly." Preheat oven to 400 degrees F (200 degrees C). Grease a 9x13-inch casserole dish. This recipe can be made a day ahead of time. Prepare through Step 5. Cover baking dish with aluminum foil and refrigerate. To reheat, bake casserole, still covered with foil, in a 350 degree F (175 degrees C) oven for about 40 minutes. Remove foil and bake until cheese is melted and bubbly, about 15 minutes more. Tasty casserole. I didn't use any dried chives on top and instead of baking the potatoes I just boiled them then mashed them. Brought this for Sunday dinner after church and it was a hit. Why in the world would anyone that considers themselves a cook use instant potatoes and bacon bits? Follow the recipe and you will be pleased with the result.